Monophyllaea species are perennial or annual monocarpic herbs (they flower once and then die). The (usually) single stem is fleshy, and most often bears a large single leaf. This is a “macrocotyledon”, the enlarged form of one of the two original cotyledons emerging from the seed. Some species are occasionally caulescent with 3-4 leaves. It is distributed widely in Malesia (from Sumatra to New Guinea and from S. Thailand and Luzon to Java), and grows predominantly on limestone rocks, in shady forests, at cave entrances and below rocks. With regard to its unifoliate habit (the macrocotyledon reaching a length of 1m in some species) and inflorescence architecture, Monophyllaea is one of the most peculiar genera of Gesneriaceae. 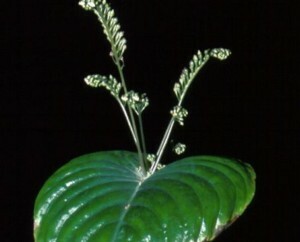 Of particular interest is M. singularis (Borneo), with the flowers emerging from the stem, technically the “hypocotyl”, and the midrib of the single leaf/macrocotyldedon (Weber 1987, 1990, Imaichi & al. 2001). In three species (M. caulescens, M. ramosa and M. elongata), several leaves are produced which copy the macrocotyledon in size and shape.